Ramzzess has posted new preview screenshots from the upcoming Beriev Be-200 project for X-Plane. Hydroz.net has released the Consolidated PBY-5A Catalina for X-Plane. Details and purchase at the X-Plane.org Store. The freeware Tolmachevo (UNNT) and Spichenkovo (UNWW) airports for X-Plane are now available at AVSIMrus. LatinVFR has posted another preview screenshot from Miami International Airport (KMIA) for FSX and FS2004. Paul Grubich has released worn and weathered cockpit textures for the A2A Simulations Boeing B-17 Flying Fortress. DH-Aircraft has posted new exterior previews from the upcoming de Havilland DH 106 Comet for X-Plane. Eagle Rotorcraft Simulations has released the long-awaited freeware Bell 206B JetRanger III for FSX. Pavel Karasek has released the freeware Let (Yakovlev) C-11 for FS2004. Download at AVSIM. 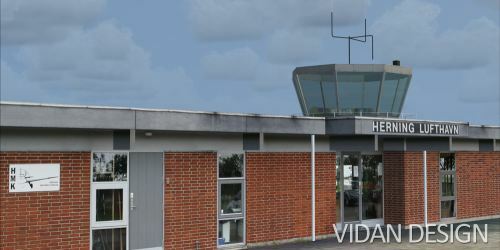 Vidan Design has released Danish Airfields X Herning Lufthavn (EKHG) for FSX. Now available to purchase at SimMarket. Burkhard Renk has released version 5.4 of MyTraffic X Professional for FSX. More information and purchase at SimMarket. Sim Skunk Works has updated the donation-ware Lockheed F-104S Starfighter for FSX to version 3.1.0. - Aircraft are loaded without payloads, weapon can be dynamically added using the configurator panel. - Once delivered weapons disappear from wing/fuselage racks. - Launch is animated and visible in both single and multiplayer mode. - Dynamic model (aka FDE) has been revised and refined. - Almost all reported bugs have been fixed. Samdim has posted a picture of the 2d overhead panel from the upcoming Majestic Software Dash 8 Q400 for FSX. Project Airbus has updated the freeware Airbus A320 for FS2004 to version 2.1. Details in the Project Airbus Forums. - Applied custom engine fan animations. Added windmilling. - Applied the custom tailhook animation so the cargo doors open slower. - Changed the exit assignments to the A321 config. - Applied the new antenna hiding method. -Fixed a smoothing issue near the cockpit windows. - Improved the specular shine. - Added a missing antenna just ahead of the v-stab. - Replaced the CFM and IAE engines with the improved A321 versions. - Replaced the flap fairings with the more accurate A321 versions. - Applied the new surface droop code. - Updated the pilot models in the cockpit. - Tweaked the APU shape at the rear. - Applied the custom nose gear steering code. - Added windshield wiper objects (unanimated). - Removed the jetheat effect entirely. - Added hardcoded double strobe and beacon sequences. Lionheart Creations is offering 50% off on the Quest Kodiak and Epic Victory VLJ. Sale Ends November 13th 2011. Trieng-Trieng has posted a promotional video from the upcoming freeware Mogadishu Intl. Airport (HCMM) scenery for FSX. IRIS Simulations has posted another preview image from the upcoming F-15E Strike Eagle for FSX. Orbx has posted a teaser screenshot of Vehicle Flow in the upcoming Fall City Airport (1WA6) update version 1.2. FSDreamTeam (FSDT) has posted Preview 3 - Pushback Truck from the upcoming Ground Services X (GSX) for FSX. ATC-Sim, the free web based air traffic control simulator, has added Dubai International Airport (OMDB). Carenado has posted new preview screenshots from the upcoming Beechcraft King Air C90 for FSX. Didier Bur has released the freeware Bar-le-Duc airfield (LFEU) for FSX. Available at Flightsim.com. The freeware Omsk Tsentralny Airport (UNOO) for X-Plane is available to download at AVSIMrus. Virtualcol has released Tocumen International Airport (MPTO) for FSX and FS2004. Purchase at the Virtualcol Store. TOCUMEN detailed Terminal including the northern extension of the terminal remodeling. Moving jetways and some catering service for your plane. Moving stairs at the South Ramp. McPhat Studios has posted preview screenshots from the PMDG 737 NGX - United Airlines (UAL) HD Textures. Turbine Sound Studios (TSS) is holding a competition to design the TSS company aircraft livery. Details in the TSS Forums. John Venema from Orbx has announced the development of FTX Great Britain for FSX. Robert Graf has released the freeware Mariazell Airport (LOGM) for VFR Airfields Austria X in FSX. The first official X-Plane 10 presentation by Austin Meyer at FSWeekend 2011, part 2 of 6 has been posted on YouTube. RealScenery Atlanta for X-Plane in Development? RealScenery is already hard at work on the next photo scenery (perhaps Atlanta?) for X-Plane. Aubrey is putting the finishing touches on the soon to be released MD-902 Explorer for X-Plane. The free Global Aviation Magazine Issue 2 is now available to view and download at the GAM Website. Area 51 Simulations has posted updated preview pictures from the upcoming Boeing AH-64 Apache for FSX. McPhat Studios has posted preview screenshots from the PMDG 737 NGX - Ryanair (RYR) HD Textures. Turbine Sound Studios (TSS) has posted the first development video from the Airbus IAE-V2500 HD Sound Package. Orbx has posted new preview images from the upcoming Orbx Harvey Airfield (S43) scenery for FSX. The first official X-Plane 10 presentation by Austin Meyer at FSWeekend 2011, part 1 of 6 has been posted on YouTube. Aerosoft has released the new runway 07L/25R update to Mega Airport Frankfurt (EDDF) for FSX and FS2004. Another teaser screenshot has been posted from the upcoming Aerosoft Stavanger X Airport (ENZV) scenery for FSX. Tiberius Kowalski has released the freeware Diego Garcia photo scenery for FSX. Download at Flightsim.com. Tiberius Kowalski has released the freeware Tubuai and Raivavae photo scenery for FSX. Download at Flightsim.com. Charles Reid has released the freeware Molokai scenery and landclass for FSX. Download at AVSIM or Flightsim.com.